There are regular bathtubs and then, there are ‘walk-in’ bathtubs. You may have your preferences but it pays to know about that each of these tubs have their own set of advantages. For instance, for the old, the infirm and those in debilitating conditions, a walk-in tub is certainly more convenient. A small door allows you to simply walk or wheel into your bathtub. Close it and the tub seals into a water tight enclosure. Enjoy a warm and relaxing bath; the risk of stepping over the edge is no longer there. A walk-in bathtub helps a great deal in maintaining the independence of those with physical limitations (such as an arthritic patient); it enables them to take a bath by themselves. But, a walk-in bath tub is equally beneficial for anybody else. Besides, walk-in bathtubs require lesser maintenance than regular ones. The Basics: What Exactly Is a Walk-in tub? 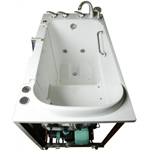 A walk-in tub is a bath tub or a safety tub with a door. The door can be opened and closed on the front or the side of the bathtub. The door allows you to enter the tub without lifting your legs, as with a traditional bathtub. The doors are sealed so well that no water ever spills out. Walk-in bath tubs nowadays come with various features such as handrails, bubble jets, in-tub seating and adjustable shower heads. They are a boon for people with mobility issues. Once you are properly seated in the walk-in tub, the specially designed faucets ensure that the water temperature is adjusted faster than a traditional tub. You can also pick a design, which includes a hand-held showerhead. The elderly and handicapped are the primary customers for walk-in tubs. 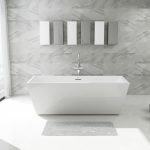 Such tubs are also getting popular with other customers because these are taller and narrower – making them ideal for smaller bathrooms and converted closets. There are two primary designs available in the market, the in-swinging door or a door that opens outside. Depending on your physical prowess, pick a design that best suits your needs. 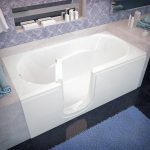 The most obvious advantage of a walk-in tub is the fact that it is of great help to somebody with mobility issues, as it reduces the chances of slipping to minimal. Read on more to know about other advantages. Allows the head to stay above water. The textured pads, hand rails and seats ensure that you can keep your head above water at all times. Increases the value of your home. If your home has a walk-in bath, let us tell you that real estate agents or property management companies will value it more. Helps in detoxifying the body. Soaking your body in a walk-in tub is very easy. The water helps you relax and thoroughly cleanse your body. The air jets give a powerful massage. Walk-in tubs with air jets rejuvenate the skin and give it the much needed massage after a long day. The bubbles are very effective in calming the nervous system. Very helpful in arthritis. If a loved one is suffering from arthritis, investing in a walk-in tub will turn out to be a great decision. Reduction in blood sugar levels. 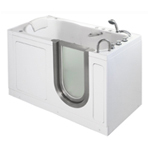 Many type II diabetic patients have reported reduction in blood sugar levels, better sleep patterns and a relaxed body after using a walk-in tub. 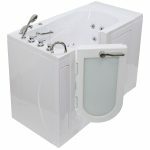 Selection: Which is the Best Walk in tub for me? A Walk-in tub is great for seniors, people with mobility issues and all those who find it somewhat difficult to get in and out of a traditional tub. But with so many options in the market, choosing the right one for you can be a little baffling. Here are some tips to help you make an informed decision quickly. Lowered threshold. A good quality walk-in tub will have a watertight hinged door with a threshold that is usually 3 to 7 inches. Built in accessories. Standardized walk-in tub models will have a built-in seat, anti-slip floor, grab bars and a handheld shower. Should match the size and layout. The walk-in tub that you choose will depend on the size of your bathroom and your physical needs. Look for a lifetime ‘leak proof’ door seal. Only choose a company that offers a warranty on the seal of the door and on the operating system of the walk-in tub. Check the size of the tub. Most walk-in tubs have three feet high walls and are 26 to 32 inches wide. Although most of them fit in a 60 inch standard space for a tub, if required an extension kit can be used. Choose between inward or outward opening door. If a loved one uses a wheel chair and is physically big, an outward opening door will be the best. But do keep in mind that outward opening doors require more space. Fills fast and drains faster. Since you have to wait for the tub to fill in, a tub that fills up faster is more suitable. Similarly, you won’t be able to open the door till the water drains out.